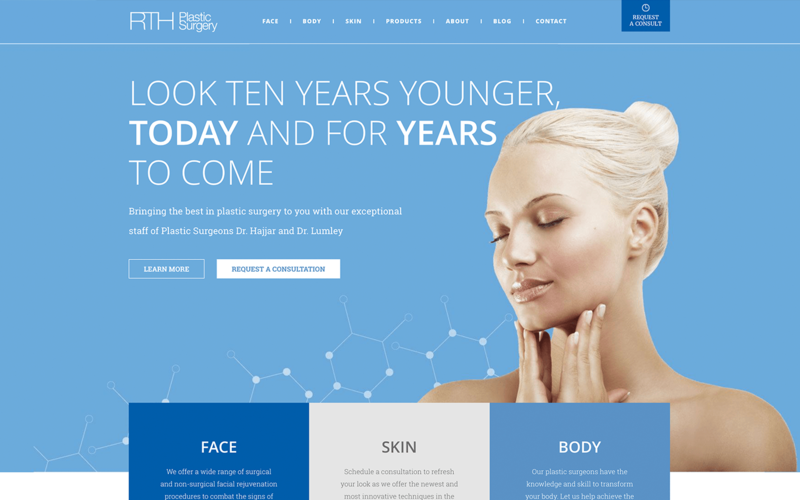 RTH Plastic Surgery (rthplasticsurgery.com), is a Southeast Michigan based reconstructive and cosmetic surgery practice. As a current Search Engine Optimization (SEO) client, we were selected to design and develop a brand new website for them. The objective was to create a beautiful looking, mobile-responsive, website that provided their clients with the information necessary to decide whether a procedure is right for them. The homepage provides the user with clear messaging on who RTH is and what they do. The navigation is set up to allow for the user to efficiently find the information they are looking for. 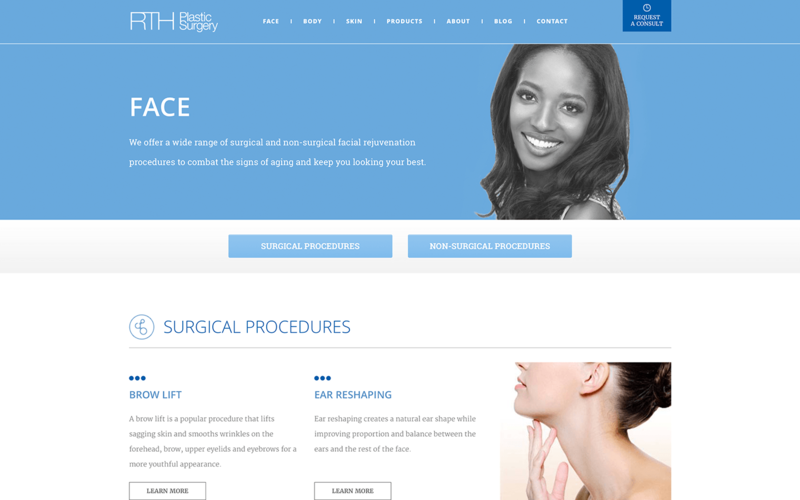 There are several ways for the user to access information about procedures, the practice, and how to contact RTH Plastic Surgery. This user experience was planned to give people multiple entry points to the information they’re looking for. Every page has multiple calls to action (CTAs) to prompt the visitor to request a consultation to learn more about their options. As a current SEO (Search Engine Optimization) client on our roster, design, and development with SEO as a focus is something we strive for. The content is carefully crafted to achieve the SEO goals set forth and to give RTH Plastic Surgery the highest organic search rankings possible. RTH Plastic Surgery is a full-service plastic surgery practice supported by board-certified Michigan plastic surgeons. RTH Face & Body is a licensed and accredited skin care center. Both are located in Bingham Farms, Michigan.